Another great plant from Western Australia, Lysiosepalum involucratum attracts a good deal of attention when in flower. It is overlooked by many gardeners and is not offered for sale very often. Fashions in gardening do deny us access to many great plants and this is another example. 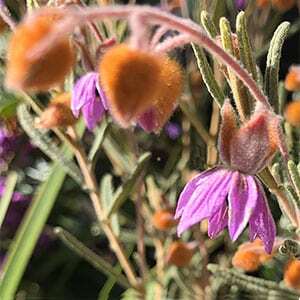 Attractive mauve to purple flowers hang beneath the stems, opening from fuzzy brown buds which reflex above the flowers on opening to create a set of small wings. Flowers appear on longish arching stems which give the plant a rather graceful look. Best planted near the font of the border where it can be appreciated. If you have good drainage and a sunny position then this is a remarkably easy care plant. It is originally from South Western Australia, and will grow well in other zones. Light pruning after flowering will keep the plant in a nice bushy form. Propagation is usually from seed and is also possible from cuttings of the current seasons growth. Flowers – Pink to Mauve in spring.